You can call it a measure of revenge or a shot at redemption. Whatever you label it, Iowa has a chance to get it over the next couple of days. The Hawkeyes started a string of three straight games against teams that defeated Iowa earlier this season with a 63-55 win over Purdue on Thursday. Up next on the Hawkeye redemption tour is a rematch with Indiana (18-9, 10-5) at 2 p.m. Sunday at Carver-Hawkeye Arena. The Hoosiers rallied for a 79-74 win over Iowa (16-11, 6-9 Big Ten) in Bloomington, Ind., on Feb. 4, starting a four-game losing skid for the Hawkeyes that ended with Thursday’s win over Purdue. The loss at Indiana earlier this month was particularly tough for the Hawkeyes to forget. Iowa led by as many as 17 points in the third quarter and took an 11-point lead into the final quarter, where the Hoosiers then outscored the Hawkeyes 32-16. Indiana shot 83 percent in the fourth quarter of the 79-75 win and made all four of their fourth-quarter 3-point attempts. The two teams went in different directions following the first meeting in Bloomington. Iowa lost its next three games before Thursday’s win over Purdue. The win over Iowa started a five-game winning streak that the Hoosiers bring to Iowa City on Sunday. Indiana has won eight of its last nine games to pull into a three-way tie for third place with Michigan State and Minnesota in the Big Ten standings. Iowa, meanwhile, is alone in 10th place with three games to play, one game behind three teams currently sitting at 7-8 and two games back of sixth-place Nebraska at 8-7. Bluder has made no bones about her goal of finishing the season 9-9 in conference play. To get to 9-9, the Hawkeyes need to earn wins over Indiana, Penn State and Illinois to end the season and would push for a top-six finish with a .500 record. To get past Indiana, the Hawkeyes will need to slow Hoosier sophomores Tyra Buss and Amanda Cahill. The duo combined for 42 points and 18 rebounds in the first meeting with the Hawkeyes and are averaging a combined 33.4 points and 13.6 rebounds per game on the season. 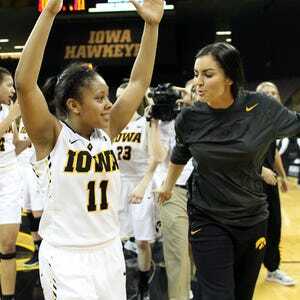 Stat leaders: Iowa – Ally Disterhoft 16.9 ppg, 5.6 rpg; Chase Coley 11.5 ppg, 5.7 rpg. Indiana – Tyra Buss 19.1 ppg, 5.3 rpg; Amanda Cahill 14.3 ppg, 8.3 rpg. What to watch: Who will win the free-throw battle between the two teams in the conference that are the best at getting to the line? In the first meeting, Indiana outscored Iowa 17-12 at the charity stripe and won by five. The Hoosiers lead the Big Ten with 444 made free throws, 50 more than Iowa, which ranks second. Buss leads the free-throw brigade for Indiana, attempting a league-best 225 free throws on the season, which is 74 more than any other player in the conference. The sophomore has converted a Big Ten-best 175 free throws and was 7-of-8 from the line in the first meeting with Iowa.